Oh my gosh, folks, is reptile smuggling like antiquities smuggling. The direct parallels are a bit staggering. I could probably replace 75% of the instances of the word “Reptile” in Smith’s “Stolen World” with antiquities and it would fit. You’ve got rare goods (snakes etc.) stolen from remote locations (jungles in lower income countries), trafficked by intermediaries who fancy themselves swashbucklers, imported in violation of the law, flogged in shops and at fairs with convenient and false provenances, and sold nearly openly to obsessive collectors who know what they’re buying but don’t care more about rare than legal. This is totally different than the smuggling of drugs, arms, or people. Both antiquities and reptile smuggling is that kind of different thing. Rare, elite, destructive goods that transform during movement to meet an obsessive desire to collect…Golly I just need to put my academic finger on it. I’m spending the next couple of weeks in South Africa doing just that. 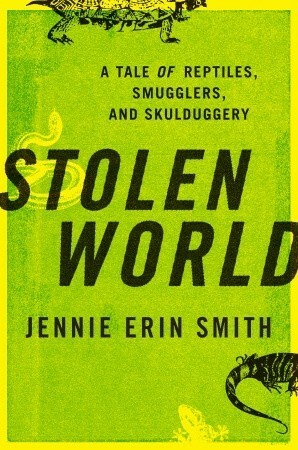 I read “Stolen World” on a series of plane rides: three continents and six countries later, I felt a bit like the globe trotting shady smugglers featured in the book, only with fewer snakes in my socks. I selected the book for amusement as I find I have trouble completely NOT working while I am reading, but I still want the release of non academic text. “Stolen World” was certainly non academic, it was fun, but as tends to happen I found myself taking notes for later official use. By the time I landed in Hong Kong and located my colleague Simon Mackenzie at a conference focused on organized crime in China, I had two pages of notes and a desire to foist them on him. What really got me was the roll of zoos in, at the very least, the illicit wildlife trade of the past. “Simon”, I said, “It’s just like museums!”. Though only a side story line to Smith’s interwoven narrative of a handful of reptile smugglers, the museums in the story do some SHADY stuff. They buy reptiles from dodgy dealers on the cheap, in violation of the law, and don’t check provenance. Or they did in the 60s and 70s, and perhaps through into the 2000s. They serve a legitimizing role in the smuggling process, lending their name and prestige and getting around the rule through their own expertise, and set trends on the market through their direct actions. Guess what? That’s what museums did/do for antiquities. Same structure, different product. Take for instance this state recorded in “Stolen World”, it come from the 1977 grand jury testimony of Kevin Bowler, reptile curator for the Philadelphia Zoo. When asked: “Were you fully aware of the face that you did not have…the requisite paper required for securing the protected species either from the country of origin or this country”, he answered yes. When asked to explain himself, he said “I guess as a zoologist and curator I thought that the law perhaps didn’t apply to somebody that was supposed to be interested in wildlife, such as myself, and that I guess I was above the law”. YES THAT! I wrote that down so hard, I could have broken my pencil, because there is something important in that sentiment that I am working on right now. This idea that academically/socially lauded expertise puts you in a place to consider yourself “above the law”. That it isn’t simply wilful violation of a regulation for personal or professional gain (though it is that), but there is an element of justifying one’s actions through appealing to one’s own caretaker role. Simon and I wrote about “appealing to higher loyalties” in our paper on antiquities and orchid smuggling, but I think this is a step further. Like, internalised expertise that’s confirmed by external lauding of your caretaker position puts some in the correct mindset to break certain types of laws in the name of what they, in their role of expert, defines as stewardship. We’ll get around to writing that paper. I’ll put it on my South Africa to-do list. Back to “Stolen World”. Well written with a surprising amount of access, I would consider this book a good way to dip your toe into the wild-life-smuggling-for-collecting world. Smith traces the pathways of the main reptile intermediaries, and several subsidiary reptile smugglers, across the globe and in to the United States from the 1960s up to the 2000s. The narrative is the product of what seems to be an extensive amount of research and interviewing on Smith’s part, and despite the multitude of players, she weaves a cohesive story that is a pleasure to read. It must have been very obvious I was enjoying it because the man sitting next to me on my flight from Toronto to Glasgow with a stop in Halifax told me he got worried for me as we were landing in Nova Scotia because I only had a couple more pages left in the book. What would I do on the Glasgow flight? He was relieved to see I had another book in reserve for when we took off again. He was right, though, I was sad it ended and I sorely want to know more about this topic. 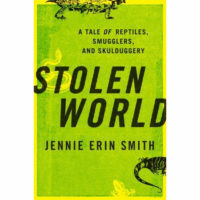 If anything, “Stolen World” has shown me that I probably need to spend more proper academic research time on reptile smuggling. PS: there are little clip art snakes and turtles and things between section breaks. Nice touch!